I was in a palace, and not any palace, the Palacio Belmonte. Sharing walls with S. Jorge Castle, it’s the oldest palace in Lisbon. Built in 1449 by Brás Afonso Correia, a member of King D. Manuel’s Council and Comptroller of Lisbon. The architecture stood on top Roman and Moorish ruins, around the ancient Alcáçova and Moorish walls. Today, the original Roman and Moorish towers still stand strong. 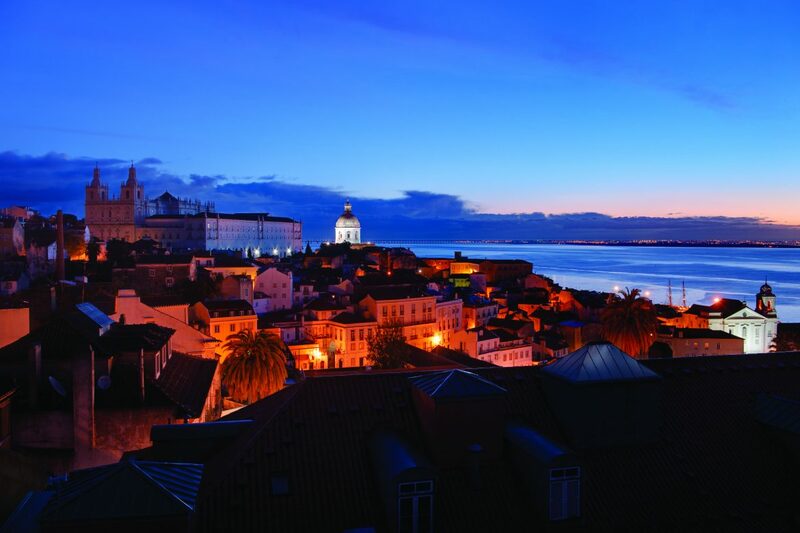 Over the centuries, the palace and its surrounding area witnessed some of the most significant moments in the history of Portugal; Vasco da Gama was received there after the triumphant return from India; it’s not hard to understand why the palace was officially classified as a National Monument back in 1910 and of National Interest in 1997. 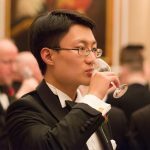 One does not have to be an expert in architecture conservation to imagine the colossal challenge of bringing such a heritage and monumental piece of architecture back to life. Restoring the tiles alone turned out to be a phenomenal task; every single piece was taken down, restored and remounted by talented local craftsmen. The whole restoration project took over 6 years to complete, with the first 2 years devoted to understanding the different phases of the construction from 130 years B.C. to 1995. Not only was extensive research carried out on the building itself, experts went at length to understand the relationship of the palace with its context; soil, light, weather, sound, plants etc. However, when Frederic, the owner, talked about this demanding task, there was hardly any sense of burden. He shared with me with lightness and enthusiasm about how the restoration project led to the revival of the Vitruve’s lime mortar, a heritage building material that works much better with the ‘terroir’ than cement, and tiled floor were red clay tiles made in Setubal, 50% baked in the sun and laid in the traditional way on top of a low temperature water heated system. 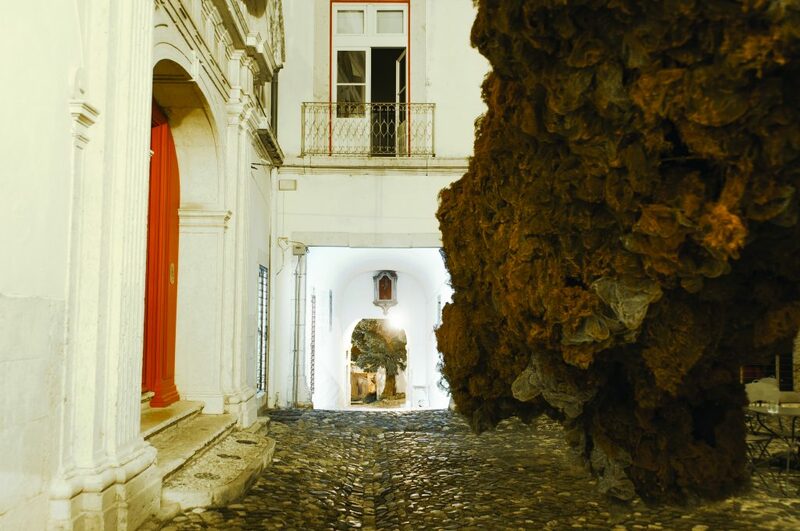 In fact, lightness was one of my sensations during my time at Palacio Belmonte. Apart from the fact that I was kept warm and dry within the palace, I always felt connected with the surrounding nature; be it the chirping of the birds, the scent of the orange trees in the garden or the simply the sunlight that woke me up. Such experiences were only made possible by Frederic’s pursuit of sustainability; natural ventilation, low temperature central heating, sophisticated insulation of the roofs, floors and walls, double glazing and the smart lighting arrangement reduced consumption level of energy by 8 times. The old construction materials was as much as possible re-used. The garden has also been totally redesigned and planted according to organic principles with usable and numerous local species, plants, fruit, trees, flowers. Moreover, there are no televisions or chocolates by the pillow to distract you. Instead, you get a handsome collection of books and music. Unlike some of its peers, Palacio Belmonte did not try too hard to wear its heritage or prestige. There were no uniformed concierge or guided tours, nor were there a grand entrance. The well-preserved heritage is quietly there for those who are interested to explore; nothing was glassed or panelled off, antique pieces are scattered around in the living spaces and the suites. At the same time, the place is fully equipped with all the modern comforts; the tropical shower was probably the best I had and the Japanese bed was extremely comfortable. Contemporary artwork and furniture knitted seamlessly into the original historic settings to form a particular and inspiring atmosphere. Even the restaurant was an inspiration! 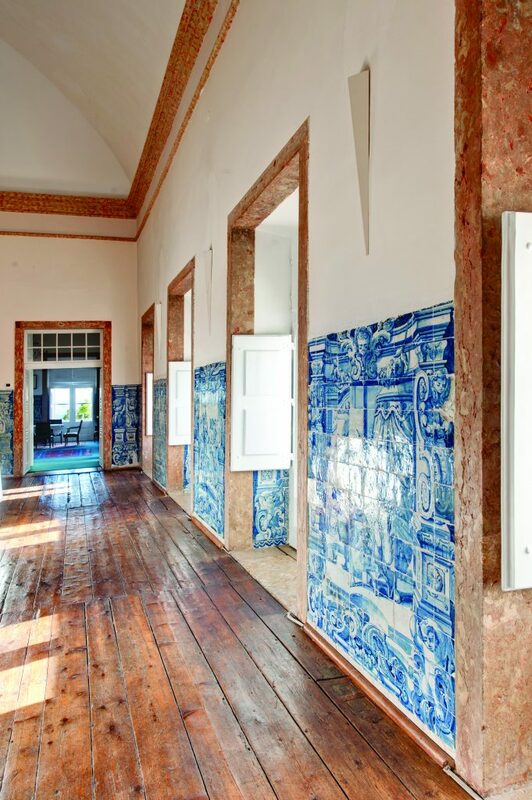 According to Frederic and his wife Maria, there has been a few trial and errors before they found Tiago Feio whose creative approach not only fitted the strict compliance of a heritage building – e.g. the temperature in the kitchen cannot be too high – but also perfectly complimented the ambience of Palacio Belmonte. There is only a daily changing tasting menu, and each dish was light and fun with prime local ingredients and inspiration from home and afar. Take the sea bream dish I tried for example, whilst the fillet was lightly poached for its tenderness, the meat along the spine was made in a sashimi fashion with local seaweed to celebrate its crunchy texture. All the goodness of this locally sourced prime ingredient shined gracefully through the effortless subtle and playful dish. I liked to wander around and explore the palace during different times of the day, without consciously trying to stick to a certain route. I felt as if I were having a conversation with the building. Either pausing in front of the a huge painting of Rui Goncalves, closely inspecting the figures on the blue and white tiles, or simply pick a book in the library of my suite, there were abundance supply of materials to ponder your thoughts on. And you do not have to enjoy the intellectual pleasure alone. Apart from the fact that members of the team are always happy to answer your questions about the buildings or the artwork, there was the Belmonte Cultural Club, where casual salons were held by the grand piano in the palace café in the front courtyard. I was fortunate enough to enjoy a piece of music composed for the palace, played by the composer herself. I was relieved to find out that team specified that ‘Palacio Belmonte is not a hotel’ although it had 10 suites, each named after an important figure of Portugal. sYou do not come here to be seen, because from a start, nobody will see you, and you see nobody; I did not bump into a fellow guest during my time there even though all ten suites were fully occupied. You come to Palacio Belmonte to relax and explore, to form a personal relationship with centuries of history in its original form inspiringly weaved together with sleek and playful contemporary designs. The palace is excitingly well preserved, yet it is not trying to render a period drama. Instead, it was fitted with a lifestyle that is light, sustainable, inspiring, tranquil and does not take itself too serious. A factory built in 1846 may not carry as much history as Palacio Belmonte, but was equally playful and inspiring thanks to its makeover into a creative island after years of neglect. It took me a while to find the place, because similar to Palacio Belmonte, it also had a quiet entrance nestled in a cul-de-sac of the old industrial quarter of Lisbon. In fact, I was hesitant as I walked pass abandoned industrial sites with the Ponte 25 de Abril flyover in close by. However, as soon as I walked through the shabby steel arch, a field of diversity, joy and energy embraced me. The 2’300 m2 quarter was filled with restaurants, cafes, shops, design studios, magazine kiosks, and people of all backgrounds. Its industrial past was evident, nothing more nothing less, and the creative crowds lived and played with it; cement mixers painted in bright colours, shop signs made to appear in harmony with the wall of the buildings etc. The most iconic piece of renovation at LX factory is arguably the Ler Devagar bookshop. I could not help notice the abundance of books on shelves that ran the full height of the almost 10-metre high walls. Yet, that was not the most eye-catching feature when I entered the place, that was a gigantic vintage printing machine high up in the middle of the room with iron staircases around it. Le Devagar was an old print factory, and the new bookshop was built around traces of its undisturbed past, most notably the giant printer. As the name suggests, Ler Devagar encourages readers to take their time in the bookshop. There are seats, beverages and food, so the space is actually a bookshop, library and café combined, plus a venue for a series of art and cultural events. The shopping experience is not grab-and-go. Instead, it was more similar to the flea market experience. The shops are also very organic, so there are definitely no touristy souvenirs, although quite a diverse showcase of designs and crafts by locals. On Sundays, there will be an additional food market to bring even more energy to the place. 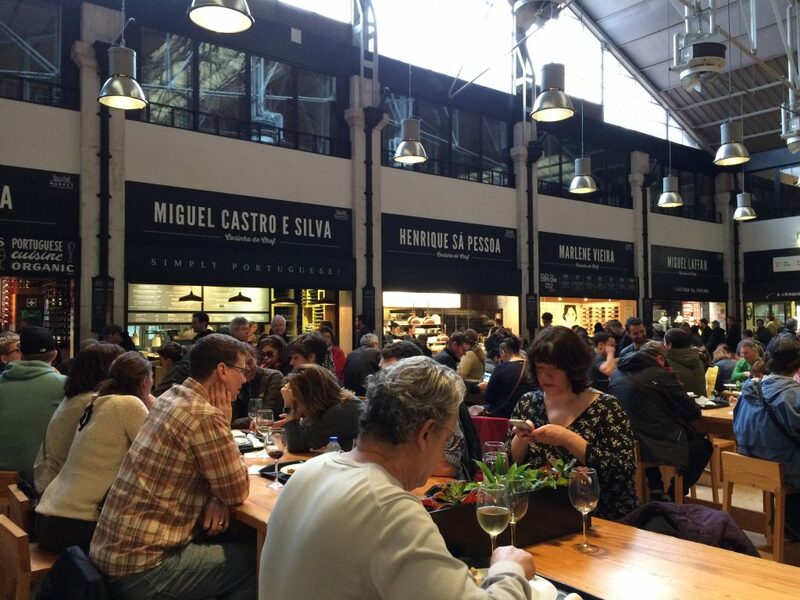 If you think revitalisation only takes place in neglected venues, just travel east along the coastline before you arrived at the renowned Mercado da Ribeira. Ever since it opened its doors in 1892, Mercado da Ribeira has been the city’s main food market. And in a city where food takes a central role in people’s life, the main food market is a place of great significance. Everyday from dawn to early afternoon, vendors and shoppers passed through the neoclassical arch to celebrate the best of Portugal and afar under the iron interior and large oriental dome. All your senses are triggered here, the variety of colours and aroma, the conversations, and of course, the tastes! However, things can be even better! In May 2014, Mercado da Ribeira stepped into a new phase; the Time Out market that runs in parallel to the food market on the western side of the building. More than 30 food stalls offer a variety of dishes from ramen to tartare, from pizza to steak, not to mention the Portugese classics such as suckling pig, pastéis de nata, croquette etc. Top chefs like Marlene Vieira, Alexandre Silva and Henrique Sá Pessoa all have their fortes here to welcome customers from 10AM right through till 2AM. It is as difficult to make up your mind on dishes and drinks as to find a vacant spot to enjoy them! To make things even more engaging, they turned the first floor into a theatre and events from concerts to cooking classes fill the calendar here. There are also a few stalls selling local crafts. The place is simply epic! Be it an old factory, market or palace, their conservations are necessary as they carry an integral part of the history and the city. However, instead of keeping them in a soap box, it is much more illuminating and fun to pump new life into them, to make their present and future as relevant and engaging as their past.